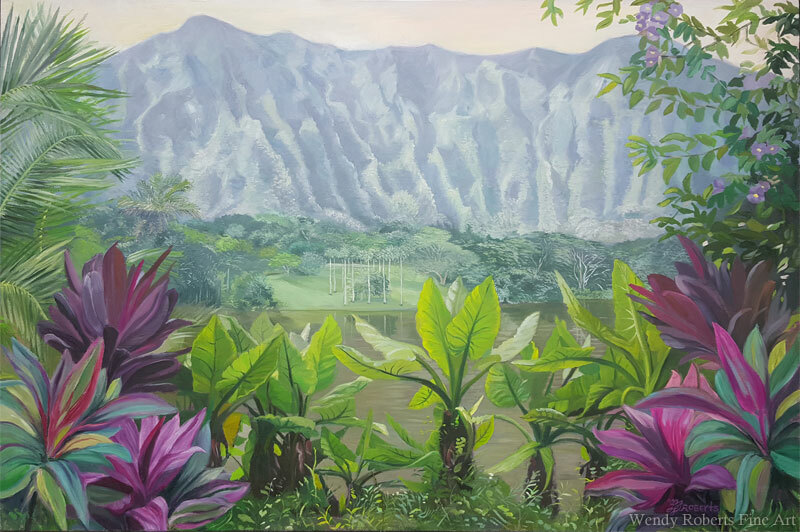 I have been getting ready for the art show at Punahou School. It happens once a year and half the proceeds go to the school. It’s a good way to help gifted students who need a scholarship to afford the rigorous top-notch education of this famous institution. I am placing three pieces in the show, the main piece is my newest oil painting, “Peaceful Sanctuary”. I wanted to use my art to make a place of refuge for our stressed-out society. Our collective minds are restless over the past few months as the world changes around us once again. I had recently seen the Zen Show at Honolulu Museum of Art, and experienced firsthand its powerful effect on my ability to focus and recenter. This isn’t a Zen painting. It doesn’t follow the rules of limited palette and limited information. However, I wanted to make an image that would have a calming impact on the viewer. It is meant to embrace and transport anyone who looks at it into a relaxing place, not just for this occasion, but for the inevitable challenges life send to us all. Art can be a powerful aid in attaining a particular mood. I want this painting to make you feel more peaceful, and provide a rest from your worries. Like its subject, this place is designed to be a refuge to revitalize you. The painting centers around the comforting, spiritual colors of blue and purple, with a myriad of greens, from softened viridian, and distant mint-greys, to refreshing yellow-greens in the foreground. I focused on creating a sense of distance with these colors to draw you into the painting’s setting and give it a sense of atmosphere. My hope is that you enjoy it and that it brings you a moment of peace every time you look at it. Imagine yourself at the side of the lake, listening to distant birds, hearing the rustle of leaves in a delicate breeze. Please accept the renewed hope and energy it offers to you, anytime you need it. Everything is going to be okay.